All images and research by Saskia Jansen. 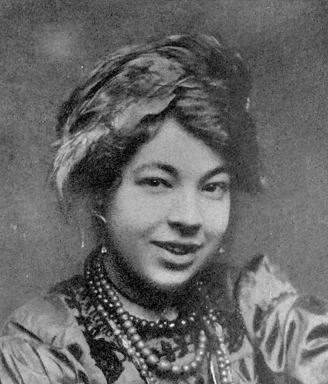 Above: Pamela Colman-Smith (1878 – 1951), who designed the Rider-Waite Tarot for A. E. Waite. 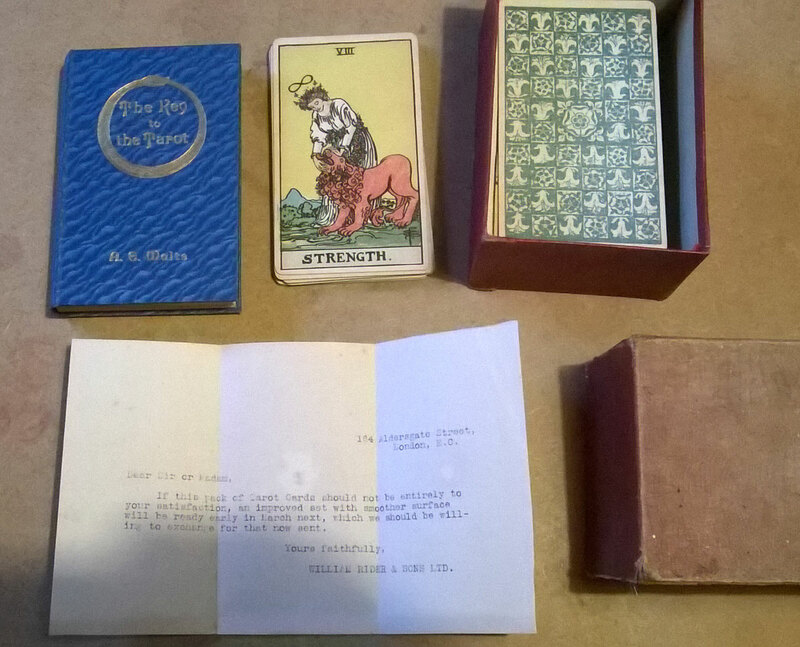 The Rider Waite Tarot was created at the beginning of the 20th century by Arthur Edward Waite and Pamela Colman Smith which would transform the concept of tarot decks. Both Waite and Colman Smith were members of the Hermetic Order of the Golden Dawn, a magical and occult society that existed at the end of the 19th and the beginning of the 20th century. 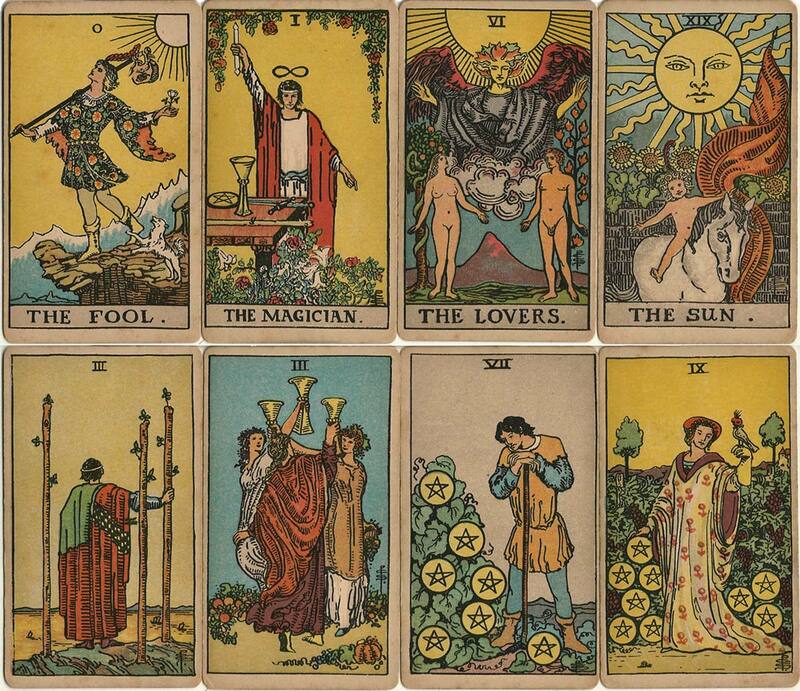 When Waite decided to make his own revised version of the tarot, with rectified symbolism, he commissioned Pamela Colman Smith to make the designs. The deck was first published by William Rider & Sons Limited, 164 Aldergate Street, London E.C. in December 1909. 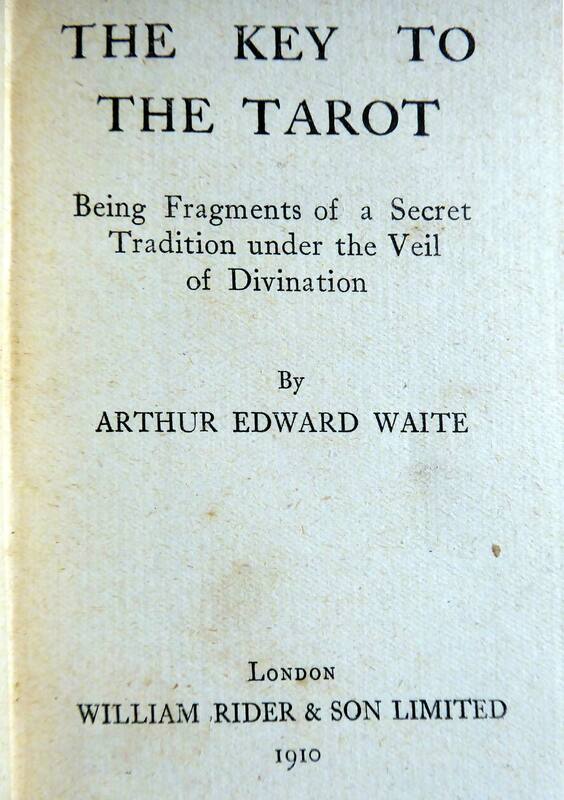 The accompanying book by Waite was called “The Key to the Tarot”. This book explained the meaning of the cards. Later an illustrated book “The Pictorial Key to the Tarot” was published, using the line drawings of the Rider Waite Tarot. The Rider Waite Tarot is different from the tarots published before in the fact that it is the first tarot with illustrated minors. The imagery on two of the major cards deviates from the standard tarot images (The Lovers and The Sun) and the sequence of the majors has been altered from the standard Marseille pattern by switching Justice and Strength. The Waite-Smith tarot grew out of the late Victorian era with its interest in esoteric and occult matters. Waite had been involved in the Order of the Golden Dawn since 1891 which became a major part of his life and work. Pamela Colman Smith drew inspiration for the minors from the Sola-Busca Tarot, as well as the paintings of John William Waterhouse (1849-1917). Her own art style is heavily influenced by the Japanese art of that time. Another art feature that is clearly visible in the cards is her experience as a theatre designer. Neither of the authors would ever know that their tarot pack would completely change the concept of tarot. The Rider Waite Tarot was printed by chromolithography. The original plates were destroyed in World War II. So far, none of the original artwork has ever been found. 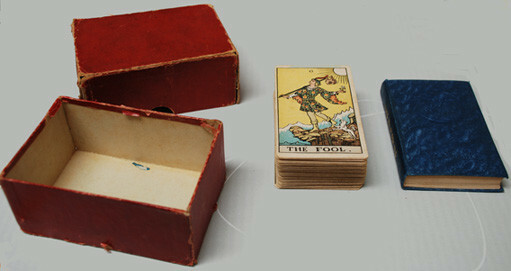 Above: cards from the 1st edition of the Rider-Waite tarot designed by Pamela Colman Smith and first published by William Rider & Son Limited in December 1909. The date of the accompanying book “The Key to the Tarot” by Arthur E. Waite is 1910, publisher William Rider & Son Ltd, London. 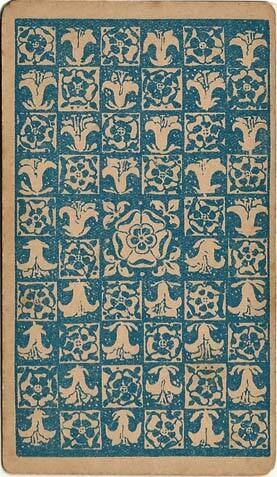 There is no printer mentioned in the book but the cards were printed by Spraque and Co. The cover of the book is blue, with the title in an Ouroboros embossed on the front and also in gold on the spine. The ‘Pam Roses&Lilies’ is the only pack that has a blue Roses & Lilies design on the back, otherwise it is identical in line art to the next edition. But the images are not always properly aligned on the cards or sometimes too big. The thickness of the pack is 38-40mm and the weight is 255 grams. Images of the early Rider-Waite tarot cards and additional research and notes courtesy Saskia Jansen.